Professor Halperin is a scholar of Jewish cultural and social history, with particular interests in nationalism and collective memory, language ideology and policy, and Jewish-Arab relations both in Ottoman and Mandate Palestine and in the early years after Israeli statehood. 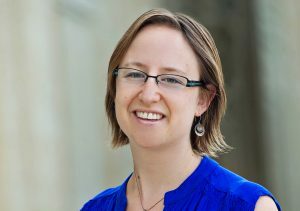 Her first book, Babel in Zion: Jews, Nationalism, and Language Diversity in Palestine (Yale University Press, 2015) was awarded the Shapiro Prize from the Association for Israel Studies for the best book in Israel Studies. She has published academic articles in The Journal of Social History, Jewish Social Studies, Middle Eastern Studies, and The Jewish Quarterly Review, among other venues. She is currently working on a second book project about collective memory in and around the European Jewish agricultural colonies (moshavot) established in late 19th-century Palestine, which were regarded after World War I as the first wave (First Aliyah) of Zionist settlement in Palestine. She received her Ph.D. in History from UCLA in 2011. She is the Benaroya Chair of the Israel Studies Program.